nice money clip with a lower profile in your pocket. Keep necessities close at hand with this money clip. Made of top-grain leather, this clip features exterior pockets for change and ID and an interior brass clip to collect and organize bills. I purchased this money clip for my High School aged son. We have purchased other standard type wallets and he never used them. This one holds his money,drivers license and a card nicely. Now my Husband wants one too. The leather is quite nice and soft. I have had this money clip for 6 yrs now and it still looks like it did when I first bought it. The money clip can hold a fair amount of greenbacks and the 2 outside pockets can store 20 cards (assorted credit cards and business cards)! The leather seems genuine because it hasn't faded or lost it's color (mine's black). So quite durable. I'm happy to see this product is still offered on this site.Summary: reasonably priced; durable; genuine leather; avoid having a wallet in your back pocket; capable of fitting most if not all of your credit cards, business cards and licence and cash into this slim leather money clip. I have bought many of these. I changed color this time. I love this wallet. 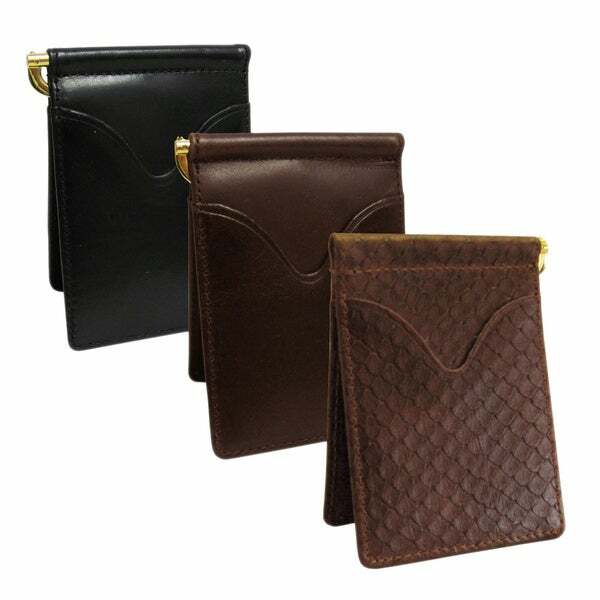 This is a good quality and very thin wallet with money clip. My husband does not like anything fat in his pocket. After almost a year, the pocket on the exterior stretched and the items he placed in it would fall out. Other than that it worked great. got this wallet for my boyfriend. it's the perfect size and just enough pockets and slits to fit his everyday cards, drivers license and military id. he doesn't carry cash on him so the money clip is used for other things, like his receipts for the day. i would recommend this to any guy that doesn't carry cash too often, seeing as the wallet won't stay closed if too many bills are set in the clip. overall slim, compact wallet!! love it. I bought this as a stocking stuffer for my husband. I was quite pleased with the quality of the leather and the money clip holder. I would highly recommend it. As perfect as it gets! The money clip is made really well but the actual clip that holds the bills in is spring loaded and very weak. Put a few bills in and the clip doesn't hold and you will loose your money. My husband hates to put his wallet in his back pocket so we've been searching for a thin wallet that will hold his ID, a couple of credit cards and cash. His previous wallets have had the spots for ID's and credit cards but the cash had to be folded twice to fit and made the wallet a little bulky. This wallet is very thin and the fold out clip in the center means the cash is only folded once. He's very happy with it and it fits nicely in his front pocket. The only complaint is the clip is gold and he would prefer silver. I was looking for a pair of wallets, not magnetic. I carry one in front pocket for small bills and "everyday credit card, and one in the rear pocket for larger bills and debit card. Security of my finances and comfort are considerations. This wallet is ideal. It is small so it doesn't bulge and make seating uncomfortable and is small enough for front pocket wear. I preferred black but it was unavailable at the time, and now I like the brown. The money clip has a bulge on one side that I worried would be a problem, but it has turned out not to be at all. Of all the wallets I looked at the price was right on this one. There is not much material or workmanship here so I didn't want to pay a high price. I have been very pleased. thinking about buying 2 more now so I want have to search as hard next time these wear out, and they all do. Not exactly what I was looking for as far as color and quality. Does not feel like leather. Has a "plastic like" texture and the brown color I was expecting was more burgandy in tone. I bought this as a gift for my husband. He was looking for a way to carry a few cards along with bills in a money clip. He is very pleased with this one. Exactly what my son was looking for. Small, but holds everything he needs. I liked them so much,I bought two more to give as gifts. The image on the website was deceiving. I guess what I paid for it's worth it, but it's not what I expected. I got the brown color and I thought the patterm was solid based on the picture on the website. Also the gold clip was rusted. Because of the shipping and restocking cost (which almost equals the cost I paid for the item), I may just donate this clip. perfect gift for both my husband & brother!! Pretty good money clip. Shipped quickly. Looks pretty classy. Well worth the money. Husband love it for his birthday gift. The big O shipped quickly.. I got several of these for male family members at Christmas and they all loved them. They had a very classy, well made look as well as being practical and thin for pockets. Great choice for any man on your list. Nice money clip holder. There's a benefit by having space for two credit cards .one on each side. The leather looks great. Still in use after more than three years. Works great! Nice enough. This was a gift for friend traveling. My husband love the convinced of the money clip Easy to get in and out his pocket. Love the texture and the color. Flexible move with you in the pocket not bulky. I have looked for this type for sometime used several years when I was a server ,these are the best . Husband loves to travel with a money clip. This one is perfect. "How do I place an order"
"Is this available in Black"
Thank you for your interest. Unfortunately, this item, in black, is presently out of stock. Items are restocked as they become available, however we cannot guarantee an item will be restocked. Please feel free to check back with us periodically to see if the item has returned and contact us with any further questions.